I am away for Christmas from Tuesday 23rd December until Tuesday 5th January. You can still place orders during this time and I will respond to any emails, but orders won't be posted until the 5th January. I will be busy over the 'holiday' making lots of new items. I have so many plans for the site in the new year, so keep checking back to see what's happening. You can also sign up to the newsletter to be kept up to date with news, exclusive offers and also be the first to know about any sales. I hope you have a fantastic Christmas. All the best for the New Year! I am back on Tuesday, so any order bought over the weekend will be posted out then. I have loads of lovely new items to go up on the site next week, just in time to start your Christmas shopping. To celebrate the launch of our shiny new website we're having a competition! 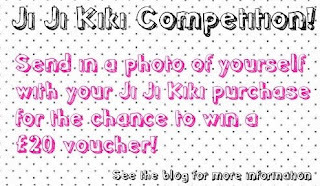 To enter all you have to do is take a picture of you with your purchase. We will choose our favourite picture, so the more creative you are the better. The winner will receive a £20 voucher to spend on the site and 2 runners up will win £5 vouchers. So why not buy your friend a Christmas present, be cheeky and photograph yourself wearing it and then treat yourself to gorgeous items when you win! You might win a prize, your friend gets a cool Christmas present...everyone's a winner!